Raptormaniacs: Hesperornithines: Super-Loons No More? Among the most remarkable of Mesozoic birds—nay, among the most remarkable of all Mesozoic theropods—were the hesperornithines. These diving birds from the Cretaceous are known to have lived in both freshwater and marine habitats, and the largest could attain body masses comparable to that of a wolf. They swam with strokes from their feet; in fact, the most specialized (and best known) forms had highly reduced forelimbs and were certainly flightless. Even with the great diversity of waterbirds today, and even with new evidence of semi-aquatic specializations in a few non-avialan dinosaurs like Spinosaurus and Halszkaraptor, hesperornithines remain prime candidates for being the most aquatically-adapted dinosaurs known. Furthermore, unlike many other maniraptoran oddballs (such as the aforementioned Halszkaraptor), hesperornithines are no newcomers to the scientific spotlight, having been known to paleontologists since the 1870s. Together with Archaeopteryx and Ichthyornis, Hesperornis is a member of the "classic trio" that always represents Mesozoic avialans in popular books about paleontology. 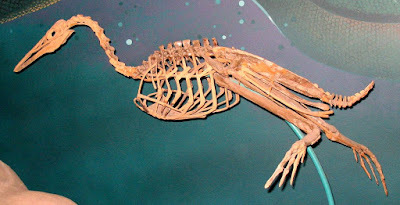 Mounted skeleton of Hesperornis, photographed by "Quadell", under CC BY-SA 3.0. Given the long period of time that we've been aware of their existence, it's not surprising that a good deal has been written about hesperornithines. Naturally, much of this literature has been spent drawing parallels between hesperornithines and extant birds, and two modern groups in particular are widely considered the best functional analogues for hesperornithines: loons (divers) and grebes. Indeed, when paleoartist Matt Martyniuk combed through the literature for hints on how to most plausibly restore Hesperornis, he concluded that hesperornithines could be thought of as "super-loons with grebe feet". Like hesperornithines, loons and grebes are foot-propelled diving birds. 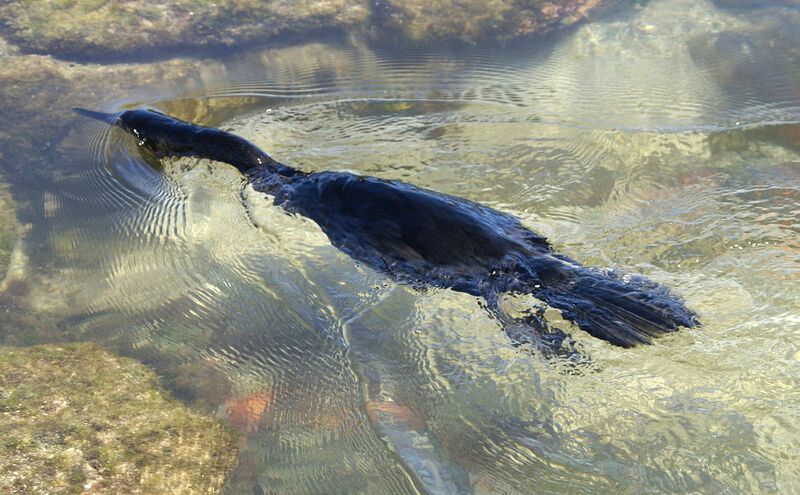 However, they are not the only modern birds that use this method of underwater locomotion; cormorants and some ducks do so, too. Despite the long history of loons and grebes being considered ideal analogues for hesperornithines, this assumption has largely been based on perceived similarity instead of quantitative analysis, with little consideration given to comparison with other diving birds. In a newly-published study, Alyssa Bell and colleagues performed the first quantitative comparison between hesperornithines and extant diving birds by using morphometrics. The authors took measurements that characterized the shape of the hindlimb bones in a variety of diving birds, including hesperornithines, loons, grebes, cormorants, and diving ducks. They then plotted these measurements against each other (after removing the influence of body size), which allowed them to assess the geometric similarity between each bone in different bird species. Flightless cormorant swimming, photographed by "putneymark", under CC BY-SA 2.0. Better than loons as a functional analogue for hesperornithines? What does this mean for our understanding of how hesperornithines lived and functioned? It's hard to say. 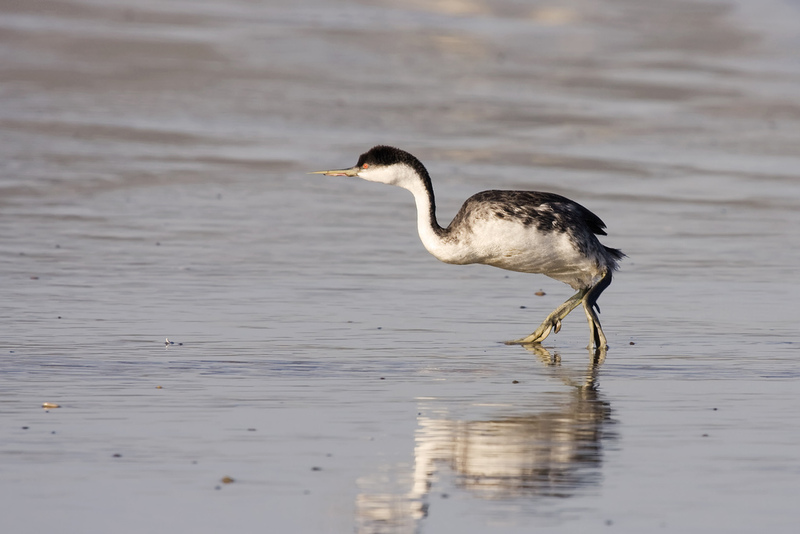 The authors point out that the influence of hindlimb bone shape on locomotion in diving birds has not been well studied, though their findings do suggest that future studies on hesperornithine biomechanics should probably look to cormorants as modern functional analogues instead of (or at least in addition to) loons or grebes. Bell et al. also investigated the popular inference that hesperornithines had grebe-like lobed toes, instead of the webbed feet common in other diving birds. This idea was first suggested in the 1930s because similarities were observed between grebes and Hesperornis in the shape of the joint surfaces between their feet and their fourth toes. However, Bell et al. found that the same joint morphology is also present in some diving birds that have webbed feet, such as the flightless cormorant. Conversely, grebe-like joint morphology is not found in coots (which have lobed toes). This does not mean that it is now incorrect to depict hesperornithines with lobed feet, but it does indicate that there is no compelling reason to think that their feet were lobed rather than webbed. Furthermore, the authors point out that the grebe-like joints are really only observed in the most specialized hesperornithines (such as Hesperornis and Parahesperornis), so even if joint morphology correlated with the soft tissues of the toes, lobed toes would have only been present in these later forms (which is consistent with the conclusions of some other recent research). Western grebe showing off its lobed (not webbed) toes, photographed by Britta Heise, under CC BY 2.0. Hesperornithines have commonly been depicted with similar toes, but the evidence for this may be weaker than previously thought. What about terrestrial locomotion? 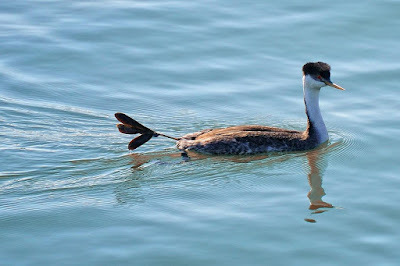 Hesperornithines have also been widely considered to have been similar to loons and grebes in how they would have gotten around on land; in other words, it's assumed that they wouldn't have gotten around well at all. Though grebes and the red-throated loon are capable of walking for short distances, it is very energetically costly for them to do so, and other loon species can't walk upright at all, instead having to awkwardly shuffle on their bellies. Cormorants, on the other hand, have no trouble with standing and walking upright on land, even if they won't be running marathons anytime soon. Do the findings of the new paper suggest that we need to rethink this aspect of hesperornithine biology as well? Bell et al. briefly address this question. Unlike in typical dinosaurs, the hindlimbs of foot-propelled diving birds are often held splayed out to their sides. As such, it is advantageous for diving birds to have a very short femur (thigh bone), because this would allow them to place their feet directly behind their bodies, increasing the efficiency of the kicking strokes that they use for swimming. A possible trade-off of this is that if the femur is dramatically reduced in length compared to the rest of the hindlimb, this may impede the ability of a diving bird to balance upright on land. Indeed, loons have the shortest femora relative to their other hindlimb bones out of all the extant diving birds examined in the study, with grebes (especially the large-bodied western and Clark's grebes) coming in second. As for hesperornithines, in the smaller and less specialized Baptornis and Brodavis, femur length relative to the foot is most similar to that of cormorants, but femur length relative to the lower leg is closest to that of the grebe genus Podiceps. In contrast, the larger Hesperornis and Parahesperornis had femoral proportions (especially relative to the lower leg) that most closely match those of loons. So if I had to guess, most hesperornithines probably could exhibit at least grebe-like if not cormorant-like gaits on land, but it appears plausible that the very specialized hesperornithids (Hesperornis and Parahesperornis) really were confined to loon-like shuffling. Western grebe walking on land, photographed by Kevin Cole, under CC BY 2.0. This type of locomotion is very tiring for these specialized diving birds and cannot be sustained for long. Based on evidence from relative proportions of the hindlimb bones, some hesperornithines such Brodavis and Baptornis may have been able to achieve at least this level of terrestrial competence. The upshot of this paper is that perhaps we should start thinking of hesperornithines as super-cormorants rather than super-loons, and we can no longer assume that they had grebe-like feet. Nonetheless, the most specialized hesperornithines may have been loon-like in their compromised ability to move on land. Of course, it's to be expected that no single group of modern birds serves as a perfect hesperornithine analogue; after all, the later hesperornithines evolved specializations for swimming and diving more extreme than those of any foot-propelled diving bird today. Most of all, this study highlights the need for us to test long-held assumptions using hard data instead of first impressions, or else we risk pigeonholing ourselves in nooks that may not, in fact, provide the best fit. What sounds do these animals make? Can't say I've heard the calls of any of those animals.